If you would like to write a comment or ask a question you can do so. I really appreciate comments and feedback — it’s the lifeblood of any author (money is a close second). And there were some really good comments below the postings so far. 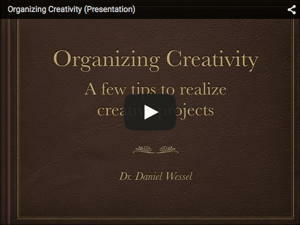 I also like questions related to organizing creativity. You have tried something out and it did not work, or have a problem that costs you time and energy — ask. I like to look at these problems, because — for me as someone not emotionally involved — they are fun to solve and give me ideas for future postings. I love thinking about them (even if at times, I do not have a solution ;-)). if available, via the comment boxes below the postings: I had them disabled for a while and still trying to find out whether the new solution avoids spam. I hope so. Simply fill in the fields. via eMail: Send an eMail to: organizingcreativity at me dot com Simply replace the at and dot with the things you usually see in an eMail address (it’s a hurdle, I know, but a manageable one). This will probably also attract spam, but I trust my eMail spam filter. It will also solve a problem that occurred a couple of times when someone asked a (good) question but did not leave a reply address in the comment box. As usual, I will not misuse your eMail address. A good question or comment might end up in a posting but the most I will mention is your first name (unless you want that I mention more). Note that I do not have a facebook account (I hope, not sure whether facebook actually deleted the profile I once had), mostly due to privacy concerns. I haven’t yet found a social network I like (Google+ is no alternative in privacy, and Diaspora and Friendica lack scope). 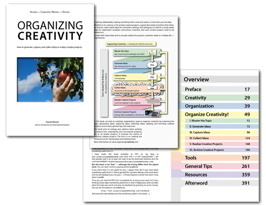 After thoroughly reading your organizing creativity website, I have decided to conduct my research using DevonThink Pro Office, CPN, and Scrivener (together with EndNote X7) softwares. 1. Correct me if I am wrong, but after you read a PDF file on iPad via GoodReader or via Skim using Macbook (like I do before I purchase iPad 5 which is coming out soon) do you export your highlighted text and annotated notes to both CPN and DevonThink softwares? 2. Do you replace (i.e. delete) your original unannotated source grouped in A-Z registers folder within DevonThink with the file with highlighted text and annotated notes? 3. What is the reason of keeping copies of those annotated PDF files in a separate DevonThink database labeled as “read sources”? 4. When you say keeping those “annotated PDF files,” do you mean that you keep the whole file together with those annotations or just highlighted parts and notes without PDF parts that you find irrelevant? 5. My weakest point is the use of CPN. Do you attach each annotated file within CPN so you can have an easy access to them once you start writing your outline in CPN where each cell is tagged with the source? Do you use only one CPN notebook for that purpose (i.e. not one notebook for sources and another one for actual writing of your outline)? I apologize from being maybe too broad but any help would be greatly appreciated. Nah, only to CPN. I have reading notebooks where I store all notes (in case I want to refer to what I got out of the article) and sort it into topic notebooks. I used to put the PDFs with the annotations/notes in a dedicated DT database, but I found that it was unnecessary. Having the content available is sufficient for me. The goal is to have the building bricks available for your own work (with the source information). No, I discard the highlighted/annotated file. I thought about storing it, but to be honest, I don’t see the point. It might be a good idea to put the highlighted/annotated file in a reference manager, but I started putting the original files in it and I like consistency, so I will probably not change it. But there could be a case be made for storing the annotated/highlighted file — if you are working primarily with papers in the sense of your work referring to a paper *a lot* and *in detail*. Personally, I found it more helpful to use a topic notebook, e.g., with a page for a specific theory and collect from different papers what this theory is supposed to do, how much support it has, its limits, etc. Paranoia. I thought I needed to keep it in case something happens to my notes. In that case I could refer to the PDFs and extract the information again. But I found it unnecessary, although CPN did give me quite a scare. No longer keep them. In retrospect, I should have imported the annotated files into my reference manager (currently: Papers 2). Papers allows you to share the PDF and automatically remove your annotations. Would have been nice, but still. Note: It might be helpful to write an overall summary on the paper after you have read it. Something that helps you to remember what the overall picture and key message of the paper was. I did store my literature by having a page for each paper (with the PDF). However, I found it too unwhieldy. I’m not interested in a specific paper, but what that paper has to say/contribute to my work. So I use Topic Notebooks. I have notebooks dedicated to my key research interests (and scientific work in general) and store the notes according to these topic sand subtopics. When I do a new paper or presentation, I refer to the topic notebooks, where the structure helps me to sift through the material and the sources as keywords tell me how to cite it. For me, the extracted information with the source information is key. Yup, good point. In many cases, I’m fine with the source (in articles and APA citation format, you do not need the page number). When it comes to books and the like or whenever I would need the page number, I can simply do a search for the highlighted (= verbatim = searchable) text. Inconvenient when you work with a lot of books (where you would need the page number) but it works for me. In that case, perhaps a reference manager like Sente might be something useful. I had a look at it a year or two ago and its annotation feature automatically captures the page number (depends somewhat on the PDF). Of course, GoodReader also gives you a page number (the ‘physical’ one, but not included in the highlights but whenever there is another page). I hope this helps. My workflow changed over time, yours will too, I guess. The nice thing about digital information is that there are usually ways to transfer the information from one form into another. What matters is that you can work with it, which somewhat depends on the discipline you are working in and its demands/characteristics. Work with something for a while, do a smaller project like a presentation or conference submission and see where you miss information or where you have annoying phases because some information was lost and change your infrastructure accordingly. The ‘perfect’ system is not developed — yet (I have a few ideas ;-)). Ah, and if you find something that really works for you, drop me a line. I’m always interested in learning more about this topic. I found your promptly replied comments invaluable. Thank you very much for sharing your technology tips. It does make an impact on students like me. I will keep you informed if my digital research method progresses in a different direction than the one presented here. hmm … so the question is where to save one’s bookmarks … good question. It’s easier with RSS feeds, for this, DT is very suited. As for bookmarks, you can simply use your Browser (e.g., Firefox) and export them from time to time for backups, or use DEVONthink and use the tags there. Use a folder/group for the bookmarks and use tags, then you can use smart groups or searches and search for a bookmark (kind = bookmark) with specific tags. Whenever you see something online that you want to save, use the Firefox plugin of DEVONthink to save the page (which includes the URL), because webpages are notoriously unstable. Not sure whether this answers your question, but I hope it helps. If not, drop me another line. 1. NO INFORMATION OVERLOAD: reviewing the files in my DTbase I discovered a lot (a LOT) of crap whose unique use was to make the db enormous and consequently useless; I had all feeds from academic journals in my main research database but, as I knew they were there I never really archived them and filed with tags and they had just become a background noise. 2. ACTIVE & RESPONSIVE RESEARCH: all the terrific software we use sometime gives the (wrong) impression that our job is just ‘managing’ knowledge because the software can make the rest. But actually the rest is thinking and that is our part of the game. Creativity should be at work also when retrieving information, annotating and so on (I’m saying this because I realized that I spent a big part of my work (and of my time) on meta-research and not on *research*! yup, that’s still what I use and would use for a dissertation or any longer text today. An outliner (e.g., Circus Ponies Notebook) and a good writing software (like Scrivener). But it has to work for you. Still, I recommend trying it out. Have you faced any problems with Skim notes after upgrading to OS X Sierra? Let me know if you happen to have a different experience. I’m curious what word processor you use after you export a file from Scrivener. I wonder if it’s Mellel or Nisus, or maybe Word? I usually export it first to Word (yeah, I know). That is usually the end format for work files (sometimes also printed as PDF). Reason being that most people use word and, well, then that’s the format we write in. Private stuff was also InDesign (until I lost access to it, but now I got it back, yeah), but also Word or simply copy-paste to WordPress/HTML (blog postings). Lovely to come across your blog again after a few years. I utilised your reading flow to great success in graduate school. As I was refining my own reading process now in academia, I sought out your work. I see that Circus Ponies is no longer supported — what do you do now? Get info on this site – and took the plunge (back) into DTOP = it is good !! Want to sync all my data back onto NAS – have you achieved this? nope, just use the sync via USB cable, which is surprisingly stable, esp. compared to earlier versions.